I picked up this new e book version of the classic Victorian tale on a whim. What I did not expect was a totally new perspective on this classic fantasy tale. As a child I read the book, but did not much care for it. After doing a bit of research I discovered that Carroll (real name Charles Dodgson) told this story to a friend and his three young children while enjoying a boat ride. The children were so pleased with it that he decided to write it down and commission John Tenniel to do the drawings for the publication. Dodgson was a mathematician intrigued by the math and science that was being applied daily to inventions as England was entering the Industrial Revolution. His other interests included reading, poetry and photography. Alice was modeled on one of these three girls. She is curious and polite. The character in the story displays fear and courage, resilience, and the ability to adapt to change. The anthropomorphic characters she encounters are a strange bunch; some of them like the Cheshire Cat and the Caterpillar appear to teach her, while others like the Mock Turtle and the Flamingo appear sillier and more frivolous. A careful reading will produce numerous evidences of mathematical reasoning and the importance that the author attaches to mathematics in the world around us; yet the reader’s main focus centers on the trials and tribulations that Alice must face from the time she falls into the rabbit hole: how she must swim herself across the sea of tears to face the challenges that many creatures present, to her ultimate escape from the nefarious Queen of Hearts at the trial, which almost results in her losing her head! Alice learns to think on her feet quickly in this coming of age tale. 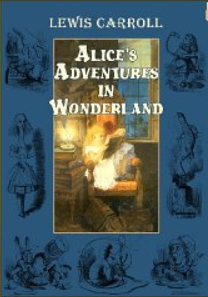 Adult readers will reminisce and recall many of the famous quotations, like “Off with his head,” and “Curious and curiouser.” Tenniel’s woodcut engraved illustrations are etched in time and delight the eye, whether in black and white or in color. The beautiful scroll work that edge the pages are a reminder of the care taken with printing books long ago. Alice is a strong, intelligent character who maintains the proper balance between respect and independence; she is probably one of the first strong female models in modern literature. This book can be used as wonderful tale for family discussion on so many levels. I would recommend it for tweens and teens as well. If you enjoyed reading this post, please subscribe to this blog by clicking on the word Follow or by hitting the orange RSS feed button in the upper right hand corner of this page. Isn’t it funny how we read children’s classics differently as adults? Perspective, Perspective, Perspective! You are right! That is why they continue to be interesting for us. This is one of my all-time favorites! Well, I actually prefer “Through the Looking-Glass,” but since both stories can often be found bound into the same volume people tend to view them as one giant book. I love how my perspective of this classic has evolved over the years. Thanks for sharing your post on KLBH! Isn’t it interesting how our view of the world as seen through literature changes as we grow and mature. A well written book has the capacity to grow and change along with its readers. My kids haven’t read many of the classics yet but this is a must read I feel. It’s part of popular culture with so many references to this book like Mad as a Hatter and Grinning Like a Cheshire Cat. Thanks for sharing at the Kid Lit Blog Hop. I think that your children will really enjoy it. This type of humor never goes out of style! I actually enjoyed this book. I remember reading it a long time ago!